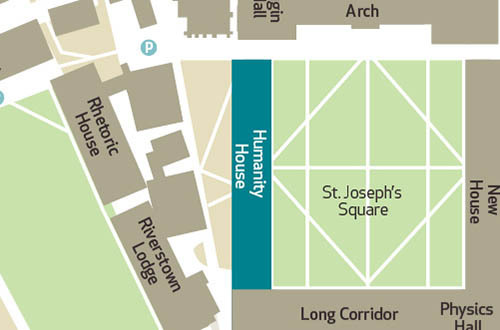 The Admissions Office is located on the first floor of Humanity House on the South Campus. The Admissions Office is part of the Registrar’s Office, and works closely with other offices in the Registrar’s Office; such as the Examinations Office and the Student Records Office. The Registrar’s Office delivers administrative support to the University community, particularly to students pre- and post-entry and also in relation to the implementation of academic policies and regulations. Find out more details about the work done by the Admissions Office. Click here for details regarding admission to Maynooth University. Táimid tiomanta seirbhís atá cairdiúil agus proifisiúnta a chur ar fáil do gach duine a bhfuil spéis acu staidéar fochéime a dhéanamh in Ollscoil Mhá Nuad. Is muid atá freagrach as riar a dhéanamh ar na mic léinn iarchéime a thugtar isteach san Ollscoil trí chóras an LOI agus ar uasiontráil chuig blianta eile trí iarratas díreach. Mar rannóg atá faoi chúram an Chláraitheora, tá an oifig seo freagrach as eolas a thabhairt do mhic léinn ionchasacha, do thuismitheoirí, do threoirchomhairleoirí, do scoileanna agus do ghrúpaí eile. Oibrímid go dlúth leis na hoifigí eile atá faoi chúram an Chláraitheora, an Oifig Scrúduithe agus Oifig Taifead na Mac Léinn san áireamh. Sample up to five degrees on our beautiful, fun and friendly campus. Experience internationally-recognised degrees in Primary Education, Law, Media Studies, Computer Science and lots more. Lunch and fun activities included! Join us on Saturday June 22nd for our final open day of the 2018-2019 academic year.